Why should we learn the Leave No Trace principles? We are taught contradictory messages about ourselves. On one hand, we are told we are unique, wonderful and can move mountains if we only wanted. We can reach the stars, change the course of history and achieve magnificent things. On the other hand, we are reminded how insignificant we are – just a tiny pebble on a gigantic beach of humankind. We are lost in the crowds, another face, and another body in the sea of people. Nothing we do truly matter on a big scale; we play in our own tiny sandboxes. Which one is the correct view? It’s a pity we often apply the wrong attitude at the wrong moments. We overestimate our importance in trivial matters when we express ignorant opinions or think we understand everything and anything, just to show how smart we think we are. We want to shine and be stars among our friends or even strangers on the Internet. It’s pretty easy and does not require much effort on our side. When it’s about protecting our ego and our wants – we are the most important humans on Earth. But when a situation requires some effort on our side for the benefit of the general humankind? Now we have a problem. Suddenly we are insignificant and our being is of no consequence. Who am I among hundreds of hikers completing this trail every month? Of what importance is my tiny little wrapper dropped on the ground among thousands already littering it? It seems like the social media made the problem of misbehavior in Nature even worse. People post photos of them engaging in dangerous or stupid activities (sitting atop a crumbling historic ruin? just stupid) and they are reposted or liked hundreds of times giving them Internet fame and encouraging other to do the same or even out-do them. It's good there are people out there educating those posters to take down such photos. Just check out this article showing great examples of dumb and damaging misbehavior in the US National Parks. If only we could switch the attitude and think of our impact on Nature of the same magnitude as our opinions on the Internet! Let’s see us as giants when crossing the Great Outdoors, where each of our steps has the power to destroy the world and change the course of history. Here we go – the Seven Principle of Leave No Trace. By following them we can try and minimize our impact on the beautiful land we enjoy while hiking and camping. These are not strict laws but rather guidelines to use in sync with our own sensibility and common sense. Learn all you can about the trail and area you plan to hike on. Check local regulations and laws. Find out if there are any seasonal closures or restrictions. Do you hike with dogs? Make sure you check if you can take them with you and if can let them off the leash. Be particularly mindful during the calving and lambing season. Before you hit the trail, you should know how much water you need and how long the trail takes. Do you need to grab a shelter with you? Are there any bothies or mountain shelters on the way? Are the trails well marked or do they require more than basic navigational skills? Are you in shape to tackle a more challenging trail or should you choose a different one? The National Parks have countless stories of rescues or deaths from people hiking arduous back country trails with no maps, sunscreen, food or water. There is a bizarre complacency with tourists in National Parks. Make sure you have all the essentials needed and that you are prepared for the hike. Check the weather forecast and assume it can be wrong. Prepare “just in case” for worse weather than expected. It might seem that if you walk off trail it makes no difference. I’m just one person, right? But remember what I wrote at the top – our impact is huge, especially when we multiply it by all the “one persons” that do exactly the same. If there is a trail – stay on it. If there is none – try to walk on hard surfaces like gravel or rock. Don’t do shortcuts and don’t walk outside of the trail b/c of some mud, causing further erosion. Make your camp on a surface that is least in danger of being damaged. Don’t walk over moss and delicate surfaces – those plants take years upon years to grow but can be damaged with just one step. If you are a group and need to cross a trail-less meadow, don’t walk in line – spread. That way the impact on trampled grasses and plants is less significant. If you choose to wild camp don’t stay in one place more than one night and travel in small groups. If you notice that a particular place has been used by others and shows signs of damage – move on and pick another place so that one can recover. Special care needs to be taken when camping near water. Find a place that is both safe for you (avoid flooding) but also makes the least impact and minimizes pollution. If you notice any animal prints at the banks – find a different place to camp as it might be a regular watering spot frequented by wildlife. Try to find a spot that is at least 70 paces from a water source and be careful around the delicate shore. Seems like such a simple idea but so hard for people to follow! Why is it that a full can of beer is not too heavy to bring into the forest but when it’s empty suddenly it weighs a ton and must be left behind? Can’t get it. Anyway – have a bag for all your garbage and take back with you all you brought in (or more if you can!). Doesn’t matter if it’s “organic” – don’t throw it away! It may be organic waste foreign to this environment and cause damage. Not only that – organic waste takes a long time to decompose and can cause animals to learn to feed off hikers. So even things like apple cores go into your garbage bag. Another issue is human and pet waste. Think before you go – and be prepared. Don’t wait till the last moment or you might have problems with doing the right thing. Have a small trowel with you to dig a cat hole 8 – 10 inches deep (some 25 cm) and at least 200 feet away from any water source. If you wild camp, prepare the spot ahead of time to make it easier. If you hike with a dog – do the same with their waste. When washing dishes, don’t throw the gray water directly into the water source. If possible, don’t use any soap at all or only biodegradable. Take some sand and use it to clean your dishes – it works great on removing dirt and minimizes the need for soap. When getting rid of the dirty water go away from the water source and pour it out in a wide angle, not in one spot, to minimize the impact. I don’t have to explain how dangerous fire is in the Great Outdoors. If you only can – don’t make open fire at all. I don’t. I just use my MSR PocketRocket stove (and Jetboil MiniMo of late), as it has basically no impact on surrounding area. I am sure it is not as romantic as sitting by a fire but I can live with it. Leave the lovely campfire time for well-established fire rings where it is legal and safe to have one. Collect only dead wood found on the ground and don’t cut any branches. Remember, that just because there is a spot after someone else’s fire, doesn’t mean it becomes legal or acceptable to make own fire. Don’t alter the natural landscape in any form. Don’t dig big holes or trenches, don’t deface or damage natural structures, and don’t take anything with you. Leave it as you found it for others to enjoy. Don't "clean" the path of fallen trees or topple rocks because you think they could be dangerous. Don't spray messages on rocks or carve your name on a tree (I know, it's seriously annoying that some people don't get it). Have you found something you love? Take a picture of it and move on so the next hiker can enjoy it, too. Thousands of protected fossils, Native American pottery and arrowheads, Civil War relics as well as countless plants and animals are removed illegally from the National Parks every year. In some cases it is a true form of theft from poachers and artifact collectors, but often times it’s the senseless collection of keepsakes from casual park visitors that does the most damage. The wild animals are not out there for our entertainment. We are the guests and have to behave appropriately. Watch them from a distance, don’t approach, and don’t try to touch or pick them up. If you hike in an area populated by bears and other bigger animals, learn how to seal your food and how to behave when you encounter the animal. Don't feed the animals, don't leave any food behind. Make sure you don’t scare animals in any way (including farm animals) – again, if you travel with dogs, control them at all times or consider leaving them at home. At Grand Canyon National Park, several deer are put down every year because they have consumed plastic wrappers that interfere with their ability to digest food. Deer and other animals like coyote, Ground Squirrel and Bighorn Sheep have have learned that these wrappers sometimes have food. Visitors feeding animals chips, crackers and junk food have developed some dangerous habits among the wildlife. Just a month ago, when I was hiking in the Silesian Beskids Mountains I had a truly aggravating episode. I walked up the hill, breathing hard and puffing like an old train. I reached a spot on the trail where on both sides there were people taking a break. Two or three of them were smoking cigarettes, creating a nasty smoke wall for all hikers. This is not what I came to the mountains for! Be considerate – there are people and animals who would love to enjoy the scenery as much as you do. Don’t make noise, don’t smoke close to others. And believe me – smoking just 5 meters off the trail is not enough. I can smell the smoke from well over 30 m with no problems. If you are a smoker and there are other people around you – please, go way away from them. It is important in particular at campsites. Please remember that tents don’t offer much of a noise protection – you are being heard all around. Many hikers like to go to sleep early on or take a nap right after the hike – keep your voice down, let people rest. When you hike with someone – talk softly, as the voice carries in the mountains. People go hiking to experience the natural quiet, to listen to birds singing and the wind whistling in the trees, not to your loud laughter or calling to your friend some long distance away. Don’t put music on speakers – use earphones if you enjoy hiking or camping with music. If you meet someone on the trail, don’t assume they want to talk. Be particularly careful around female solo travelers – don’t say jokes or comments that would make women feel vulnerable or make you sound creepy and/or predatory. Be safe, be smart and enjoy the beautiful Nature while protecting it for the future. 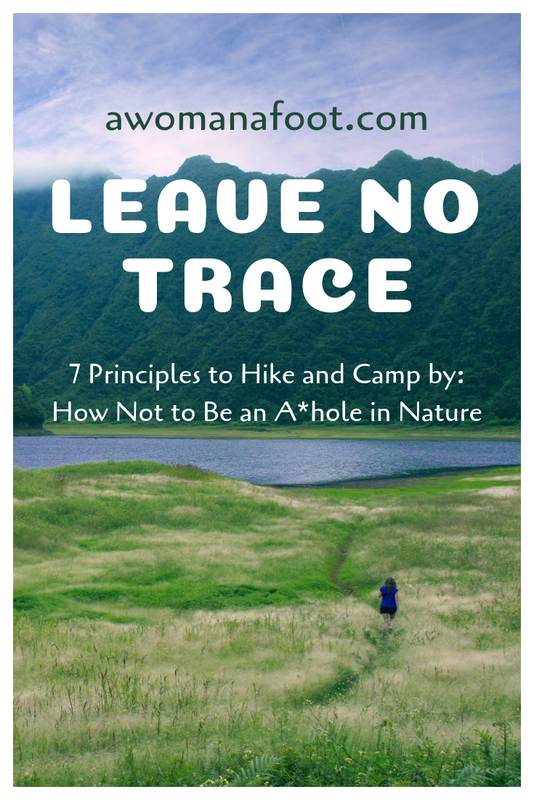 Learn more about the Leave No Trace principles at the Center for Outdoor Ethics. Would you add something to this list? Do you follow the principles? Which one do you find the most difficult to follow? advice, health, hiking while female, body positive, Trails for All!